Are you using the GetUserProfileByName web service on the InfoPath form? This issue occurs because loopback protection is enabled in the SharePoint Online environment. 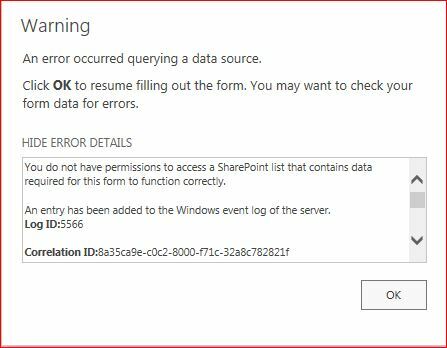 Loopback protection must be disabled for InfoPath forms to be able to connect to some SharePoint Online web services. For security reasons, loopback protection is always enabled in SharePoint Online. This is a known limitation of InfoPath forms in the Office 365 SharePoint Online environment. Method 1: You need to convert the GetUserProfileByName to .udcx file, edit it according to the Central Admin changes, upload it in Data connection library(not sure if this will work in SPO, but you can have a try). Method 2: You can convert the request(GetUserProfileByName web service) to object model calls which does not cause a loopback. Version history of attachment(doc) in Info path form? how can i add a pre-sized (publishing) image to my info path form linked to an issue list in SP2013?